Omar Abu Ali, right, speaks about the charges against his son, Ahmed Omar Abu Ali, 23, as his wife, Faten Abu Ali, looks on. The American government yesterday indicted Ahmed Omar Abu Ali, a raging Islamist, with plotting to kill the president of the United States. Details have emerged about his attending the Islamic Saudi Academy and the University of Medina. His fervent hatred of the United States apparently led to his joining up with Al-Qaeda. He had connections to Ismail Royer and the paintball jihadists. 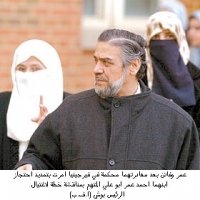 His mother wears a niqab. Islamist organizations like the Council on American-Islamic Relations (CAIR) and the Muslim American Society (MAS) jumped on his cause. Chicago Tribune: "U.S. citizen charged with plot to kill Bush"
The Guardian: "American accused of plotting with al-Qaida to assassinate Bush"
The New York Times: "American Accused in a Plot to Assassinate Bush." Detroit Free Press: "Valedictorian suspect in plot on Bush's life." The Baltimore Sun: "Family, friends denounce charges against ‘pious man'." Feb. 25, 2005 update: UPI's legal affairs correspondent, Michael Kirkland, dismisses what he calls Abu Ali's "alleged ‘plot'" as but "a sweaty fantasy under the Saudi Arabian sun." Feb. 27, 2005 update: "Case Adds to Outrage for Muslims in Northern Virginia" reads a New York Times headline today. Not a word yet from the Times, however, about the outrage of Americans about a Saudi-government school in Virginia possibly training an Islamist terrorist.